Ford Motor Company on Wednesday released its 19th annual Sustainability Report, which revealed that the automaker has achieved its goal of reducing carbon dioxide emissions from manufacturing by 30 percent a full eight years ahead of schedule. 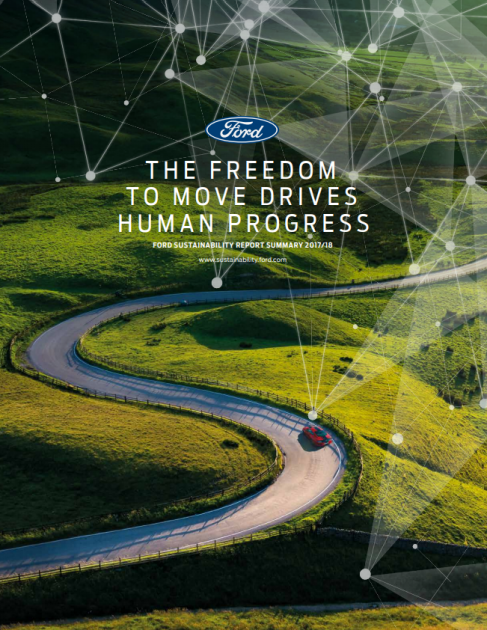 Ford’s Environmental Quality set the goal of a 30 percent reduction in CO2 emissions generated by global manufacturing in 2010, projecting that its objective would be reached by 2025. According to the Sustainability Report, Ford reached that mark last year by cutting an incredible 3.4 million metric tons of emissions between 2010-17. Hettle said that Ford is looking forward to a new objective concerning the use of renewable energies. The automaker will also continue to act in defiance of climate change deniers nested within the federal government by working to meet CO2 reduction goals set forth in the Paris Climate Accord. A joint statement from Ford CEO Jim Hackett and Executive Chairman Bill Ford in the Sustainability Report confirms Ford’s position on climate change and its efforts to help solve the crisis. Our planet is facing increasing challenges, with profound implications: greater congestion in cities, the rise of human population and climate change. Over the past decade, we have developed a comprehensive approach to manage climate change and the opportunities of a changing world. Today, this approach includes delivering CO2 reductions in line with the Paris Climate Accord and investing in the future of mobility. The future is exciting, and together we believe we can make a real difference to the world. The full 2017-18 Ford Sustainability Report can be found at sustainability.ford.com.